No one is as confounded by this 13month rally as the perma-bears. Over the course of the last two years, it seems that the "lazy baton" was handed from the buyers to the sellers. They just cannot grasp how the market can run so far, so fast, in the face of so may terrible indicators. I continually make the point that just as the bulls weren't doing their homework in 2006-2007, the bears have stayed wedded to their doomsday predictions, despite facts on the ground changing. Despite a 70% run for the DJIA off its March 09 lows, the dividend yield has only fallen from 4.1% to 2.5%, thanks to a shift in the index weights and increased payouts. 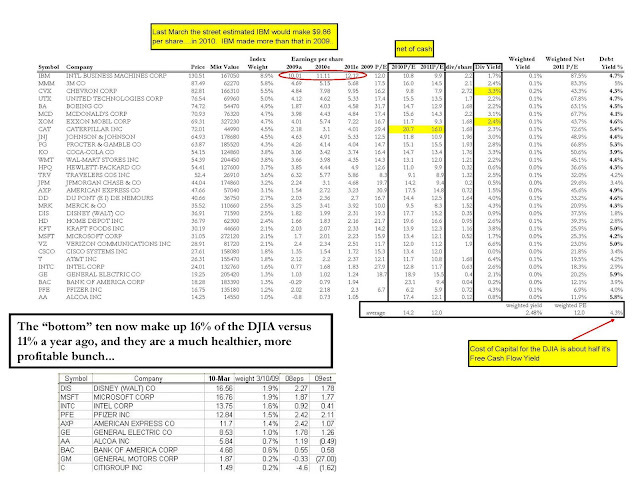 As the index has run, so too have the earnings estimates (and actual 09 results) upon which it is valued. A year ago, Intel was expected to earn 79cents in 2010...now they're expecting $1.68 per share. IBM earned more in 2009 that Wall Street expected them to earn in 2010, and that stock trades for a low teens PE and a 9-ish Free Cash Flow Yield. 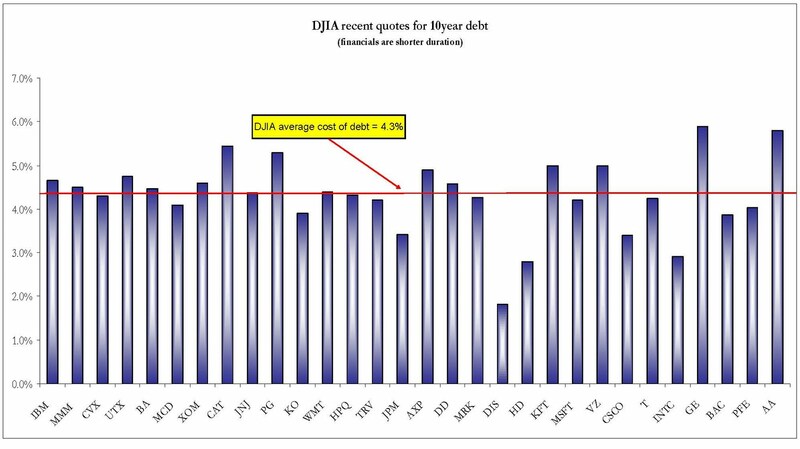 As for cost of capital, most DJIA companies can access funds for about 4.5% for 10 year debt. For many of these companies (CSCO, IBM, MSFT, the oil majors), the true cost of capital is even less, as their balance sheets enable them to borrow short(er) term for under 2%. 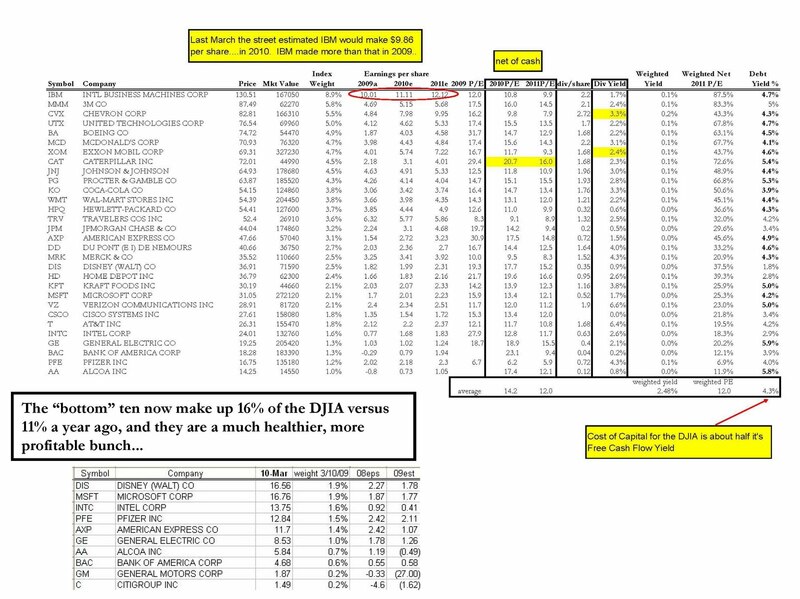 For these reasons, the DJIA does not need to yield 8-10% in Free Cash Flow Yield, but probably closer to 6-7%.